The last official game of the season reminded us why we like to play football in the cooler months. 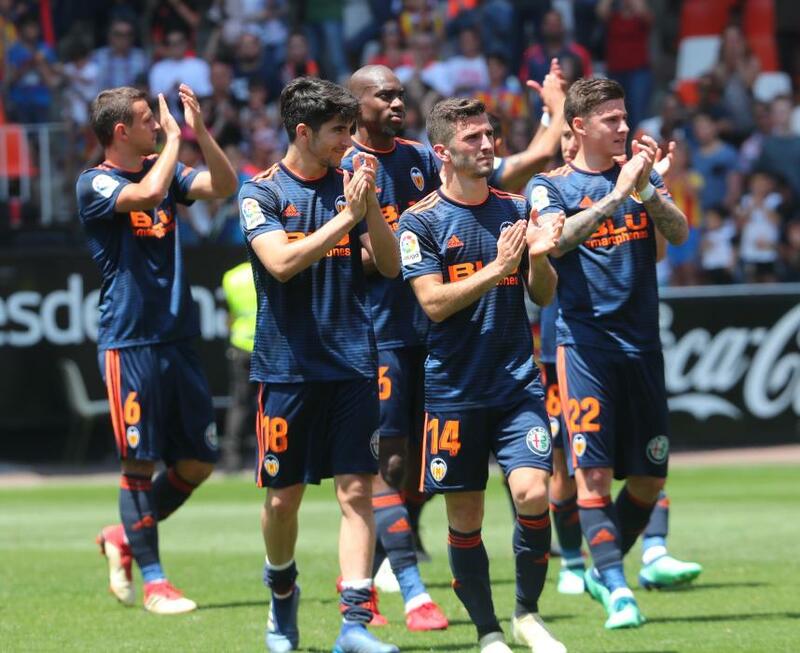 A baking hot day at the Mestalla failed to put off fans as a large crowd turned out to see our heroes for the last time for a while and for some maybe to see them for the last time in our colours. Valencia surprised us all by wearing the new blue shirts and shorts which will be our second colours next season. With Jaume in goal, Nacho Vidal on the right of defence and Murillo partnering Garay in the middle, with Gaya on the left. Good to see Maksimovic in the midfield with Parejo Soler and Guedes. Zaza and Rodrigo led the attack. Anybody expecting this to be a wind down end of the season bore would be in for a pleasant surprise. Good to see Bakalli playing for Depor after being given permission by Valencia. He was certainly getting plenty of the ball and keeping Vidal very busy on the flank. To be fair though Vidal kept him well in check, preventing him from doing us any damage. There were long spells in the first half when Bakalli was looking a lot better value than Guedes and we would wonder why we would pay all that money when we have Bakalli for free. The first half was controlled by Valencia with many chances being made. 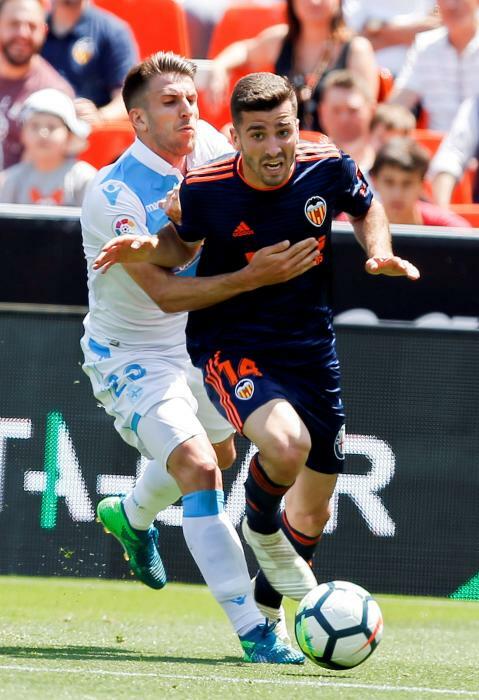 Maksimovic, with a header, Soler and Rodrigo all had good efforts. Zaza, however, broke the deadlock though when picking up a loose ball managed to fire into the back of the net to put us in front. A bit lucky really because he seemed to give a little push just before but we got away with it. 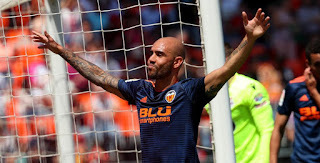 Zaza also had a good header come off the crossbar and Guedes was unlucky when the keeper threw the ball to him and all of 35 metres out he lobbed the ball to the top corner. Unfortunately the keeper made up for his error making a good save. In the 77th minute Guedes made up for it by firing in a great goal after being set up brilliantly by Vietto. He deserved something for all his hard work and running but not having much success until then. Lucas Perez came on for Depor to loud boos and whistles from the home crowd. I can only assume it was because of him turning us down and going back to his home town. A bit harsh I think and maybe he won't want to come here now. Soon after, he got his revenge by scoring a good goal to put them back in the game. This is when we relied on Jaume a lot with the visitors making many chances and could have easily scored a couple of goals to spoil our party. It was not to be though and we won a game we deserved and entertained the large crowd, who by now were just about melting in the sun. The after match celebrations, as always very emotional with Rodrigo, Guedes and Zaza being told in no uncertain terms that they are wanted here next season. Jaume 7 Made some great saves and looked calm and composed. Kept us in the game near the end. No doubts with him and Neto for next year. Nacho Vidal. 6.5 He has now given the management something to ponder. A very composed performance today. I would keep him and Montoya for next season. He is young, strong and tall enough to win balls in the air. Garay 6.5 Mr. composure. Not troubled too many times but was there when needed. Why change something that is working. Murillo 7 Back to his old self. A great performance today strong and reliable. I hope they are not looking to replace him. Gaya 8.5 Man of the match. In the 90th. minute he got caught with the ball. I mention this because it was the only flaw in a near perfect performance. Was never beaten and was faultless. Soler 6 Really disappointing again. Everything he tried to do didn't work. Kept losing the ball and making bad decisions all day. Maksimovic 7 Really looked the part today. Strong fast and good eye for the pass. Another one who can do a good job for us next season. Just been called up for his national team for the World Cup so that is good for him. Parejo 7 Had a couple of good chances to score but his shots were a bit wide. Passing was his usual high standard and top performance. Went off to a standing ovation from a very appreciative audience when replaced late on. Guedes 7 for the goal and the unlucky chip over the keeper. Apart from that had a really forgettable first half. Is he worth 40 million ? I don't know. Zaza 7 Great goal and much better performance today. There is no doubt that he is the crowd favourite here and it remains to be seen whether the money comes in to tempt him away. Hope he stays and I know that is the opposite to what I said last week. Rodrigo 6.5 Unlucky on a number of occasions but failed to find a goal that would have made his and our day.